I know it’s still November and Thanksgiving isn’t even here yet, but if you’re gonna start DIYing the Christmas decor, then you have to get started now so it’ll be ready to put up the weekend after Thanksgiving, right? Right. 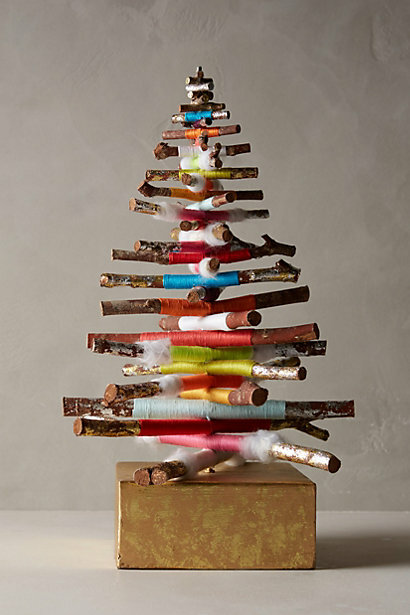 I love love love the look of this little tree for an entryway or desk, or even kitchen table! but at $88, it’s a little pricey for a stack of twigs and colored thread. How about an easy DIY?! I think it’d be fairly simple to wrap the twigs with cotton (sort of like batting cushion for the thread), wrap with colored thread, yarn, twine – whatever you choose! ), and then stack and glue the sticks on top of each other. You may need to use supports to get them highly stacked. Or just really strong glue. I wonder if it’d be easy to drill a small hole through the sticks and use a dowel? Worth a try, right? I have some left over eucalyptus branches from Declan’s Lumberjack Lunch that are pretty big (too big to stack like this) but they’d be really cute and festive wrapped in fun colors laying in our unused fireplace! I just may give it a go.